This was the 58th monthly meeting of the group. The five members attending were: Kevin Dennis, Charlie Locke, Chris Roth, Bryon Wagner, and Tom Browder. The subject of bootable USBs with persistent file systems continued to be discussed. Charlie Locke suggested using Tails as the image since it was designed to be used as a portable Linux system for use on public computers without interfering with the host hardware. Knoppix looks like another possibility as recommended by the mkusb developers. This was the 57th monthly meeting of the group. The four members attending were: Dave Bricker, Kevin Dennis, Charlie Locke, and Bryon Wagner. The group disussed the recent release of Linux Kernel 5.0 and some of its updates and enhancements. Dave Bricker passed out a flyer for PITSUG (Professional IT Security User Group) training. PITSUG has a lab that allows students to see firsthand how malware behaves and teaches them how to identify "phishing" attempts. The PITSUG website is https://sites.google.com/pitsug.org/home. Also discussed was a program called GoPHISH which is an Open Source Phishing Network and can be downloaded at https://getgophish.com. This was the 56th monthly meeting of the group. The six members attending were: Kevin Dennis, Charlie Locke, Chris Roth, Gary Scopes, Bryon Wagner, and Tom Browder. We welcomed new member Gary Scopes who came prepared with a handout on dual boot considerations for new Linux users! Gary Scopes led a discussion of issues that may cause new Linux users consternation when trying to install Linux alongside Windows 10. A copy of the detailed handout is here. The remainder of the meeting consisted of tall tales of the early days of personal computing led by Bryon with lots of contributions by Gary, Kevin, and Charlie. We agreed the next meeting will be at Props Ale House so Gary and others can get something to eat! This was the 55th monthly meeting of the group. The six members attending were: Dave Bricker, Kevin Dennis, Rick Foland, Charlie Locke, Chris Roth, and Tom Browder. We welcomed new member, Dave Bricker, who is a security expert very interested in educating the public on computer security awareness and defense. Tom also reminded members that Computer Tech 2019 is to be held on Saturday, 26 January, at the Student Services Center of NWF State College, Niceville Campus. See computertechnwf.org for more information. Tom told of his new finding that Ubuntu Linux is available on the Chromebook, and that device seems to be a good one for introducing Linux to interested persons. It may be one answer to building a portable computer lab for Linux training. PITSUG is a not-for-profit organization with the intent to educate our community on internet safety. The PITSUG team is a group of volunteer cyber security experts from the local area. PITSUG’s training allows hands-on- training that will benefit most everyone interested in computer and internet safety. PITSUG is not quite ready to go public with their project, but Dave showed us the current state of it and it is impressive! We look forward to seeing it when publicly unveiled. 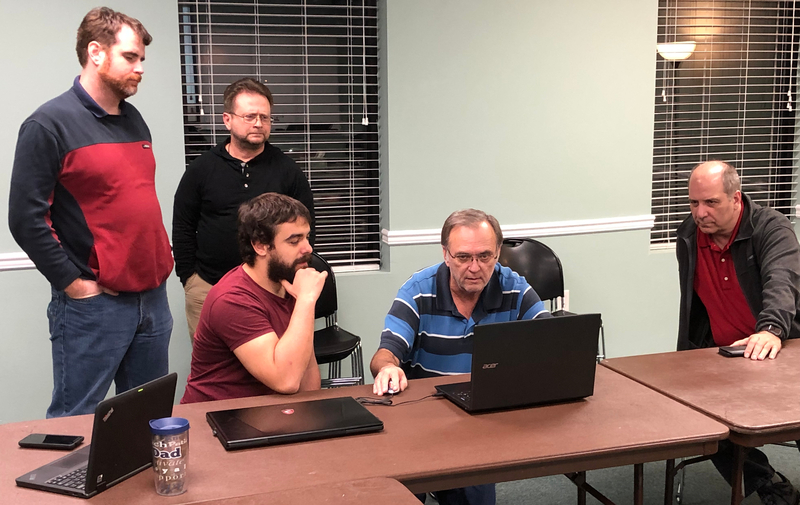 Charlie Locke has been very busy creating his own Linux distribution named "Expirion" (see picture of enthralled members watching a demo: left to right: Chris, Kevin, Rick, Charlie, Dave). It is a blend of Mint and Ubuntu and has features he likes. He demonstrated a running instance of it, and an iso image of it will be available on this site when he releases it to the world. The distro was created using Pinguy Builder. After the meeting, we took pictures of Rick, Dave, and Charlie, and got permissions from everyone present to post pictures, e-mail, and city of residence on this site. The next meeting will be on 4 February at Crosspoint. This was the 54th monthly meeting of the group. The six members attending were: Kevin Dennis, Rick Foland, Charlie Locke, Chris Roth, Bryon Wagner, and Tom Browder. The meeting was held at Props Ale House. Note: Jacob, the manager, was very welcoming and helpful. I encourage you to spend some money there once in a while since they are letting us use the facility free. When you do go there, ask for Jacob and thank him for their hospitality. Computer Tech 2019: Tom encouraged all to consider volunteering to give a presentation or otherwise help out at Computer Tech 2019 to be held at NWF State College, Niceville, on Saturday, 26 January. Contact Carl Lofstrom with your proposed topics. Commmunity Project: Tom continued discussion of a NWFLUG community project with a new idea to have a local computer lab at Croswspoint UMC Niceville similar to that at Gregg AME Chapel in Fort Walton Beach. The group agree to participate and we discussed various aspects of things needed to be done to handle security concerns and background investigations. Tom has contacted the church to see if staff are interested. Quantum Geographic Information System (QGIS): Charlie Locke presented a handout outlining steps for installing the latest version from qgis.org. He demonstrated some of the very high-quality maps they produce for all parts of the earth. In the ensuing discussion other systems were mentioned such as OpenStreetMap (an excellent replacement for the Google Maps API! ), Yahoo Maps, and Microsoft Maps . Kevin mentioned member Rand Fernandez now works at NWFSC. This was the 53rd monthly meeting of the group. The seven members attending were: Kevin Dennis, John Fay, Rick Foland, Amelie Lanoue, Charlie Locke, Chris Roth, and Bryon Wagner. Kevin Dennis showed his stack of Pi Zeroes--unfortunately, he was unable to hook them into the projector this time. Returned to the discussion on the Pi and discussed possible server uses for Pi presentations. Bryon Wagner talked about free 3D printing at the Eglin AFB library. Discussion and demonstration on how 3D printing has been used to build an actual bridge in Norway and its future uses. 8-track, cassettes, and technology used to play cassettes on 8-track players. This was the 52nd monthly meeting of the group. The seven members attending were: Kevin Dennis, Rick Foland, Amelie Lanoue, Charlie Locke, Chris Roth, Bryon Wagner, and Tom Browder. We welcomed new mwmbers Rick Foland and Charlie Locke. Rick is a Windows IT pro but wants to learn more about Linux. Charlie has lots of Linux experience through his work as well as his hobby. Tom started off by handing out a list of local civic and community groups he plans to send letters to in which he will offer a member of our group to speak about Linux and what it can provide. He also handed out a copy of the draft letter to be sent. After much discussion, it was decided that we would add some backup slides in categories for discussion if the situation so warrants it. For example, hardware projects with Rasperry Pi, lots of free games, educational programs, and other FOSS for both Linux and Windows. Other topics to add: Pixar using Blender as a major software tool. We then briefly discussed the problems with generating persistent file systems on a USB drive, and Charlie Locke offered some documents on methods he has used successfully. We agreed to meet at Crosspoint again for the November meeting, and probably have the December meeting at Props Ale House. For future reference, make reservations for the front room at Props Ale House wuth the manager, Jacob Holbrook. Phone numbers: 850-586-7117 (ext. 2) or 850-460-5525 (M). See Charlie Locke's document on hwo to make a persistent, bootable USB drive here. This was the 51st monthly meeting of the group. The two members attending were: Kevin Dennis and Amelie Lanoue. Amelie was the moderator and the meeting was held at the new Props Ale House in Niceville. There was a glitch in that the reservation Tom had made earlier was made with a hostess, but it was not forwarded to the manager, Jacob Hollbrook. In the future, reservation requests should be made with him directly (phone: 850-460-5525). This was the 50th monthly meeting of the group. The six members attending were: Carrie Carlton, Kevin Dennis, John Fay, Tony Giodarno, Chris Roth, and Tom Browder. We welcomed new members Carrie Carlton and Tony Giodarno. Both heard about the meeting through the Bay Beacon (although the NW Florida Daily News is again carrying our meeting notices!). Tom mentioned the Props Ale House has opened in Niceville (in the old Helen Back Cafe building) and asked if members would like to meet there periodically. Everyone agreed and we decided to meet there in September. Tom gave a presentation on installing Perl 6 on a Linux computer. The presentation consisting of him demonstrating the installation scripts for the Rakudo Perl 6 Star release available on his github.com repository as shown in this directory. Kevin gave us an update on the tricky business of creating a bootable Linux USB drive with a persistent file system. His attempted creations with any Linux system other than Ubuntu have not been stable when attempting to boot with them on hosts others than the one that created them. For the next next meeting he will try again with Ubuntu, the recommended distro for the creation tool he is experimenting with. The next meeting will be at the usual time, 5:30 PM, on Monday, September 3, 2018, in the front room of The Props Ale House in Niceville. Note that Monday will be Labor Day, but Tom intends to be there early and will remain until at least 6:00 PM awaiting at least one more member. Carrie and Tony both agreed to have their pictures taken for the website, and also to have their respective town and email posted. Their pictures are now shown on the "Members" page. This was the 49th monthly meeting of the group. The four members attending were: Kevin Dennis, John Fay, Bryon Wagner, and Tom Browder. We discussed the upcoming Computer Tech 2019 and our support of it. Kevin Dennis demonstrated a bootable USB with Linux and we had a lively discussion of how difficult it is to get a reliable bootable USB for unknown hardware. Tom announced that the Northwest Florida Daily News is now carrying the announcement of our monthly meeting in the Sunday edition of the paper (as long as Tom, or someone else, notifies Brenda Shoffner at least 22 days prior to the event). Post meeting news: Tom reports that the new Props Pub is now open in the renovated building that once held the Niceville location of the Helen Back Cafe. He will investigate it to see if it is a suitable location for a bi-monthly social meeting which will alternate with the Crosspoint venue. This was the 48th monthly meeting of the group. The five members attending were: Kevin Dennis, John Fay, Amelie Lanoue, Chris Roth, and Tom Browder. We welcomed new member Amelie Lanoue, a student at UWF studying cyber security. Tom then gave a presentation (here) on his home network mods based on suggestions by Kevin and Chris. The key feature of the mods is a separate firewall appliance using Opnsense software (https://opnsense.org). Kevin gave some more suggestions about subdividing the network into separate subnets and allowing specific routing for inter-device traffic based on rules in the future Opnsense firewall. Kevin also described his plans for using a virtual white board for his presentations at next year's Computer Tech (see https://computertechnwf.org/) which will have an emphasis on Augmented and Virtual Reality (AR and VR). Additionally, he plans to show us his 3D network devices at the next meeting. Finally, Tom gave a short talk on his continuing failure to produce a bootable USB with a persistent file system, running any Linux distro, that works on his older laptop. He tried both the YUMI Multiboot USB Creator and the Universal USB Installer, both found at https://www.pendrivelinux.com/. Kevin took up the challenge to produce a good bootable USB, with persistence, with the caveat that his method has to be (1) reasonably easy and (2) usable on most modern laptops. Tom lent him a USB for the project. Lastly, we disussed again the possibility of alternating meeting places monthly and we were informed that a new, pub-like place, Props, will soon be opening up in the old Helen Back location--Tom, for one, will check it out for suitability. The next meeting will be on 2 July at the Crosspoint Church at the usual time. This was the 47th monthly meeting of the group. The three members attending were: Kevin Dennis, Chris Roth, and Tom Browder. Tom reported that the NWFLUG Facebook site, owned and maintained by Kevin Dennis, is now shown as a link on the NWFLUG website's home page. Also on the home page is a link to the draft slides for the proposed community project briefing of "Why Linux?" Finally, Tom mentioned he has a list of civic and other community groups which he plans to use to write letters (USPS or e-mail) offering to speak at group meetings about Linux. Kevin showed us a site for creating auto diagnostic tools using open source software and Rasperry Pi hardware: . He is planning a Carberry device project and will show it to us when complete. Finally, Tom showed a funny comic strip, from Dzone, featuring parents and grandparents of Linux users getting on the Linux bandwagon: . This was the 46th monthly meeting of the group. The two members attending were: Chris Roth and Kevin Dennis. Chris and Kevin took advantage of the meeting and looked at the specs for the Rasperry Pi 3+, they watched a video of someone who made performance boosts for an N64 emulator, and they looked at various novelty cases for the Pi. This was the 45th monthly meeting of the group. The five members attending were: Ellis Boudreaux, Charles Carter, Kevin Dennis, Chris Roth, and Tom Browder. We welcomed new member Charles Carter. Charles found out about us from attending one of Tom's sessions at Computer Tech 2017. He attended this session because he saw the announcement on our website about Kevin Dennis's planned presentation on OpenVAS. Tom Browder reviewed the current draft slides for the proposed NWFLUG "standard" talk on presenting Linux to local community groups. The revised slides incorporate comments and links provided by Kevin Dennis and Carl Lofstrom. Charles Carter pointed out the importance of the lead-in to grab the audience's attention, and we will send the current draft out to all members again for specific changes. The current draft of the talk is available here. Kevin Dennis gave a talk on the OpenVAS (Open Vulnerability Assessment System) project and showed, using his home network as an example, how it could be used to assess one's vulnerability to a wide range of threats. He discussed several specific examples of threats he had seen and how they were so pervasive. He reviewed the importance of a good firewall, and recommended another firewall inside the outer-facing firewall to provide an extra layer of security. He described the general architecture of two types of home networks: (1) one that does not respond to unsolicted incoming queries (probably the usual case) and (2) one that serves data to unsolicited, but legitimate, external queries. The next meeting is scheduled for April 2. This was the 44th monthly meeting of the group (there was no meeting held in January 2018). The six members attending were: Kevin Dennis, John Fay, Chris, Perr, Chris Roth, Bryon Wagner, and Tom Browder. We welcomed new member Chris Perr. Chris has been planning to attend for some time and we're glad to finally meet him! The overall attendance was about 360. Note that some NWFLUG presenters did not register for the event--presenters should also register. This was the 43rd monthly meeting of the group. The three members attending were: Chris Roth, Patrick Womack, and Tom Browder. Ellis Boudreaux sent a link to a site hosting various Rasperry Pi projects which may give us some ideas for a good hardware Linux demo project. See it here. Tom reported that no library or church so far, of the four contacted, has shown any interest in our lending them a PC and laptop running Linux. Tom recommends we press ahead with developing a hardware demo per past discussions along with a good, tailored briefing for parents and students on the benefits of Linux and the locally-available resources. The next meeting is scheduled for 1 January 2018 at the Helen Back Cafe. This was the 42nd monthly meeting of the group. The two members attending were: Frank Mahala and Chris Roth. This was the 41st monthly meeting of the group. The seven members attending were: Louis Carter, Kevin Dennis, Jesus Fuentes, Jonathan "JJ" Johnson, Chris Roth, Bryon Wagner, and Tom Browder. This was the 40th monthly meeting of the group. The ten members attending were: Bryan Allen, Ellis Boudreaux, Louis Carter, Jonathan Johnson, Lanier Johnson, Mike Kaiser, Chris Roth, and Tom Browder. We welcomed new members Ellis Boudreaux, Jonathan Johnson, and Lanier Johnson. Also welcomed back after long absences were Bryan Allen (last mtg 2015-12) and Mike Kaiser (last mtg 2016-09). This was the 38th monthly meeting of the group. The four members attending were: Kevin Dennis, Frank Mahala, Chris Roth, and Tom Browder. This was the 36th monthly meeting of the group. The five members attending were: Louis Carter, Kevin Dennis, Chris Roth, Joshua Salazar, and Frank Mahala. We welcomed new member Josua Salazar, an active-duty NCO who works with Kevin and Dennis. Good food and beverages were enjoyed by members as we met at the Helen Back Cafe in Nicevill. Kevin discussed facebook and that apparanlty our website can't be found by fb, odd, he did find some other large Linux groups that only seem to meet there, and thought if we could like them then maybe some of them might be local and like to come to a meeting as well. Facebook idea really needs further investigation. Raspberry Pi and the things that could be done with it. Joshua had never heard of it, so we spent some time with it. Louis was looking for how to run some things headless. Talked about how Bose has been getting all the info on everything users of their wireless headphones were listening to. Without the users knowledge. Which led into an odd subject of how an "Adult Toy" manufacturer was doing the same thing. Discussed pfSense and some of its capabilities with Squid and Squid Guard, the Guard addin will block ads just as the Pi-Hole does. Which is nice, one box then takes care of network things. Discussed the build of a pfSense box, and Kevin mentioned it could be a money maker for those who might be interested. Went into my build. I bought a new mother board, with an embedded (soldered on) CPU, intel Celeron quad core 1.5ghz, uses only 10 watts, (Asus J3455M-E) no fan for CPU needed, 16gig of memory and a 1tb hard drive, four port HP NIC (rebranded intel) probably overkill, my thinking was to future proof it, for about five years. Also discussed some more of the router vulnerabilities that keep popping up, the new LinkSys WRT ones (one I talked about last month) have been found to be even more problematic. Belkin (the new owners of LinkSys) though seem to be working closely with those who have uncovered the problems and is working to get patches out. Note from Frank: pfSense will be upgrading their hardware requirements with version 2.5 which is due next year sometime. The new requirement will be for the CPU to support AES-NI, and from what I can find out, most CPU's in the last five years or so support AES-NI. Also they will only produce 64bit. Apparently they are getting into more encryption too. Still haven't finished my build so still no parts recommended. This was the 35th monthly meeting of the group. The six members attending were: Kevin Dennis, Frank Mahala, Joe Reyenga, Moira Reyenga, Chris Roth, and Tom Browder. This was the 34th monthly meeting of the group. The four members attending were: Kevin Dennis, Frank Mahala, Ashley Klima, and Bryon Wagner. This was the 33rd monthly meeting of the group. The five members attending were: Kevin Dennis, Frank Mahala, Joe Reyenga, Chris Roth, and Tom Browder. This was the 32nd monthly meeting of the group. The ten members attending were: Zachary Cornitius, Jonathan Johnson, Ashley Klima, Frank Mahala, Joe Reyenga, Moira Reyenga, Fiona Riley, Chris Roth, Bryon Wagner, and Tom Browder. We welcomed new member Jonathan "JJ" Johnson! This was the 31st monthly meeting of the group. The eleven members attending were: Zachary Cornitius, Kevin Dennis, Alex Grover, Ashley Klima, Frank Mahala, Joe Reyenga, Moira Reyenga, Fiona Riley, Chris Roth, Bryon Wagner, and Tom Browder. We wished Zachary well on his TDY to the Middle East. This was the 30th monthly meeting of the group. The nine members attending were: Kevin Dennis, Jesus Fuentes, Ashley Klima, Richard Larson, Frank Mahala, Andrew Merts, Fiona Riley, Chris Roth, and Tom Browder. We welcomed our guests (and now new members) Ashley Klima and Fiona Riley, both from TEKSystems, a personnel recruiting firm specializing in technical personnel. This was the 29th monthly meeting of the group. The eight members attending were: William Botsford, Kevin Dennis, Richard Larson, Frank Mahala, Andrew Merts, Chris Roth, Harry Ward, and Tom Browder. We welcomed new member Richard Larson, but had to say farewell to Harry Ward who is leaving the area to go back home to Indiana. Bon voyage, Harry, we enjoyed your company for the short time we had together. This was the 28th monthly meeting of the group. The six members attending were: Mike Kaiser, Joe Reyenga, Moira Reyenga, Jimmy Touma, and Tom Browder. This was the 27th monthly meeting of the group. The nine members attending were: William Botsford, Dean Covey, Alex Grover, Frank Mahala, Andrew Merts, Daniel O'Connor, Joe Reyenga, Moira Reyenga, and Tom Browder. We welcomed new members William Botsford and Daniel O'Connor. We were also honored by the presence of Joe's daughter, Moira, age 4, who entertained us with interpretive art on the whiteboard as Alex presided. See the agenda slides, which also include Alex's Elementary OS presentation, here. Tom mentioned that Rand Fernandez and Jimmy Touma are propsing we give a prize and certificate to the robotics team, from one of the school levels (elementary, middle school, or high school) that wins the local competition season. We will decide the details next meeting, announce the award to the appropriate group, and start collecting the $100 prize money. Tom will modify our certificate to reflect the new purpose and present it as a draft for approval at the next meeting. Alex gave a presentation on a new Linux distribution (distro) that has the goals of being safe, secure, ad- and spyware-free, light-weight, beautiful, and with a desktop that will be familiar to iboth PC and Mac users alike. The default set of packages is minimal, but many are available for installation. The distro is based on Ubuntu 16 LTS, and a user will probably want to add LibreOffice and other favorite packages immediately. The distro is expected to work on hardware buit from 2003 or later. The default (and only) web browser is new, and most users will probably want to install the more familiar Chrome or Firefox. The display is very nice and clean and very Mac-like, but it also has MS Windows features. The audience agreed that it seems to be a good choice of distro to recommend for those looking to step up to Linux. Alex noted that the distro does have a terminal window that is easy to find. The website is shown at link  in the list below. Alex introduced a meeting feature he called "Monthly Pick" where the moderator asks attendees, in turn, for anything they would like to recommend or mention. He started off by mentioning a weekly show of Linux information, by Jupiter Broadcasting, called the "Linux Action Show" (see link  below). Following are responses from the attendees. Frank mentioned two websites he's interested in: Steve Gibson's "Security Now," (a weekly, on-line show) and a cloud management project. See links  and  shown below. Andrew mentioned a periodic show by Matthew Garrett (investigating various products and software), and an I2P project similar to Tor but for groups. See links  and  below. Tom mentioned another weekly he heard about at the recent Perl conference he attended, but he couldn't recall the name of the show. It was started, and is still hosted, by Randall Schwartz, one of the well-known Perl experts (after Larry Wall) and the author or co-author of several popular Perl books. Randall was at the conference and he recommended the show to attendees. The show is the "FLOSS Weekly" and the website is at link  below. Daniel mentioned Viber, a useful app available for most devices, and WhatsApp, a mobile messaging app. He also mentioned that Facebook reports that WhatsApp is now working again in Brazil. Links are at  and  below. Daniel also asked the members for any recommendations for a free program similar to MS's Project. Alex mentioned he had briefly used "ProjectLibre" whose website is at link  below. Alex said of the product, "I only used it to make a few gantt charts but it seems rather robust." The next meeting is scheduled for Monday, 5 September, and will be moderated by Frank Mahala. That is Labor Day and the church will not be open, so we will have the meeting at Helen Back Cafe in Niceville. We have the front meeting room reserved. Any laptops will need an HDMI cable for input to their TV monitor. This was the 26th monthly meeting of the group. The ten members attending were: Kevin Dennis, Alex Grover, Frank Mahala, Rand Fernandez, Chris Roth, Skip Sheldon, Jimmy Touma, Bryon Wagner, Harry Ward, and Tom Browder. We welcomed new members Alex Grover and Jimmy Touma. See the agenda slides here. We have been discussing what to do about a community project this year for several meetings. We discussed again, whether to buy a robot and sponsor a team, or provide a prize for one or more competitions. Rand Fernandez and Jimmy Touma have much experience with the local school programs, and the schools are not lacking for robots. Thus we decided to sponsor a prize, and Rand F. and Jimmy T. agreed to come up with a prize proposal given their knowledge of the robotics competition in the local area. Tom showed a short video of a new, lightweight, Ubuntu-LTS derivative, distribution (distro) called "Linux Lite," version 3.0. Its website is here. Although the distro looks good, Tom has not yet had a successful installation on VirtualBox on either Windows or Linux for either the 32-bit or 64-bit versions. The advantage of the distro is that it can be used on older, less-capable computers. The website has details on requirements. Mr. Ott Sathngam has scheduled a Linux installation for next Monday with Tom. Anyone interested is invited to attend and help out as needed. Alex Grover mentioned another interesting, light-weight, distro, for experienced Linux users only. It's Debian-based and called CrunchBang++ (#!++). Jimmy also mentioned he is interested in forming a Python working group. Tom offered to share time and space with the not-really-off-the-ground-yet Niceville Perl Mongers (NPM) group which has the same room and time as the NWFLUG reserved, but on every third Monday of the month. Jimmy said he may shoot for an initial meeting on the third Monday in August. Frank Mahala said he had discovered some information on a security vulnerability for Intel's Management Engine (IME)which is a separately run system integtrated into at least some of Intel's CPU's. The IME is apparently subject to all kinds of evil malware which enable someone to spy on everything you use the computer for. Kevin Dennis said AMD CPU's are supposedly not vulnerable to that bug. Frank also said, at least on his network, he discovered that the IP address 192.168.100.1 gives him open access to the router connected to his ISP. No one else has seen that, and we could not access Crosspoint's router using that method. Tom Browder told those present he was tired of prepping and leading the meeting every month (sine April 2014 with about three missed meetings), and asked for a volunteer to take over the job. He said he would continue to run the website and help with the meeting as needed. Frank Mahala immdediately volunteered to take one meeting per quarter, staring with September, thanks, Frank (who has stood in as meeting leader before)! Then Jimmy Toumas said he would lead the October meeting, thanks, Jimmy! And then Alex volunteered to lead the August meeting, thanks, Alex! The next meeting will be on Monday, 1 August, at the same time and place, and Alex will be leading the meeting. We were able to get mug shots of four members: Rand Fernandez, Skip Sheldon, Alex Grover, and Jimmy Toomy, and they are now on the website (see the Members link on the menu to the left). Thanks, gentlemen! Don't forget to check the NWFLUG website regularly. And please offer corrections or suggestions! Be thinking about having a social meeting later this year, maybe in November. This was the 25th monthly meeting of the group. The ten members attending were: Louis Carter, Zachary Cornitius, Kevin Dennis, John Fay, Sally Hills, Frank Mahala, O.T. Outhaithany, Chris Roth, Skip Sheldon, and Tom Browder. We welcomed new members O.T. Outhaithany and Sally Hills. Sally Hills was our invited guest representing the Doolittle Institute (DI). She is the Program Manager, Mini-Urban Challenge, for the DI. She gave us an overview of all the robot programs in the local school systems, and let us know that there are various volunteer positions if anyone is interested. For instance, they are alway looking for judges and mentors. Contact her at <sally.sage.hills@doolittleinstitute.org> if you are interested. Sally's slides are available here. For more details on the high school robotics program, see the Mini-Urban Challenge (MUC) website. Note that on the MUC website their resources page covers the robot equipment in much detail. Note that the latest robots have a Linux OS and can use several languages for programming them. We might consider sponsoring a team, or at least co-sponsoring a team. Kevin Dennis showed us his work-in-progress (WIP): a 3d breadboard consisting of a plastic crate with zip fasteners holding various pieces of hardware including a router, switch, a Raspberry Pi, and connecting cables. His goal is to build a very low-power box with one or nore Pi servers running various useful programs and acting as a hardened firewall between his ISP and his home network. Planned server services include squid, Pi-hole, and a VPN. He also plans to add an interface to a local NAS. He hopes to show us more progress at the next meeting. Frank Mahala gave a brief introduction to the project Library Box which he is excited about for many reasons. He sees several use cases for it including: taking digital materials anyplace needed where on-line access to the Internet might not be available. Also, it could be used for presenters who might have a laptop but do not have access to a projector, in which case they can provide their presentations to audience members with laptops or other mobile devices. Tom Browder presented a short briefing and demonstration of the companion programs wkhtmltopdf and wkhtmltoimage. The programs are available from their website: http://wkhtmltopdf.org/. Tom's briefing slides are available here. In summary, the programs are valuable tools for anyone needing a nice copy of a web page for any purpose. Tom reminded the group that Carl Lofstrom (sandcloud@embarqmail.com) is looking for more presentations for Computer Tech 2017 to be held at NWF State College on Staurday, 28 January 2017. He also needs a keynote speaker, and Tom proposed to Kevin that he think about volunteering for it. During various discussions, Zachery mentioned he is taking some Linux courses on-line for a very reasonable price. See his source at the Linux Academy. Due to the first Monday in July falling on the 4th, we voted to have the next meeting on the 11th of July. The meeting adjourned on time. This was the 24th monthly meeting of the group. The nine members attending were: Louis Carter, Dean Covey, Kevin Dennis, John Fay, Frank Mahala, Joe Reyenga, Skip Sheldon, Bryon Wagner, and Harry Ward. We welcomed new member Harry Ward. Discussed Never10 - a program written by Steve Gibson of https://www.grc.com/ that prevents Windows Ten from being installed on a Win 7 or 8 machine and removes all the Win 10 downloaded files, turns off the Win 10 nag, and updates requests. Asked for other news, on Science Fair or anything else the members knew of and the question came up about the robot challange and minecraft project Rand is involved with, though no one had anything definitive. I gave the demo/discussion of the Pi-Hole, see attached pdf, and I believe there are two or three more people going to try it as well. Brian was able to add to the discussion as he uses the automated intall at his home and is very pleased, while I use the manual install. Kevin was surprised to find a list of malware sites that is updated, that can be added and blocked as well. There were good questions and discussions. Brought it up and Brian said "Gee the diagrams look just like my setup." Skip asked if there is a Linux mapping software like Mapquest, that could be installed and NOT require an internet connection. No one knew of any and a brief online search didn't show anything either. Closed the meeting at seven. This was the 23rd monthly meeting of the group. The nine members attending were: Louis Carter, Kevin Dennis, John Fay, Jesus Fuentes, Frank Mahala, Joe Reyenga, Chris Roth, Zachery Cornitius, and Tom Browder. We welcomed new members Jesus Fuentes and Zachery Cornitius. One decision was made to affect later meetings: henceforth meetings will start at 5:30 and end no later than 7:30. Note also that the technical difficulties with the meeting room have been rectified. We discussed changing our computer science award to one for the winner in the local robotics compitition sponsored by the local 501(c)(3) organization, the Doolittle Insitute. Tom will invite a representative to a future meeting to investigate a formal relationship. The question arose about how to find out what's playing on NetFlix and Zack found the answer: http://whatsonnetflix.com/. It was agreed to add two new links to the Resources page: the Doolittle Institute and the Linux Kernel. Tom also updated the group on planning for Computer Tech 2017 and encouraged members to consider volunteering to make one or more presentations. Interested members should contact the project leader, Carl Lofstrom (sandcloud@embarqmail.com). This was the 23nd monthly meeting of the group. The nine members attending were: Jack Burk, Louis Carter, Dean Covey, Kevin Dennis, Rand Fernandez, Frank Mahala, Skip Sheldon, Bryon Wagner, and Tom Browder. We welcomed "new" members Jack Burk and Skip Sheldon. New is in quotes because both men had already attended the February installation meeting, but this was their first normal meeting. Note that Skip was one of the first to respond to the initial meeting announcement back in March 2014. Tom gave an informal discussion of his new Github project for configuring popular open source programs (https://github.com/tbrowder/config-scripts). Tom also gave an overview of an interesting operating systems (OS) project that may be of interest to Raspberry Pi experimenters like Frank Mahala and Bryon Wagner. According to the Minix inventor, it was the inspiration for Linus Torvald's Linux OS. See the Minix 3 project. 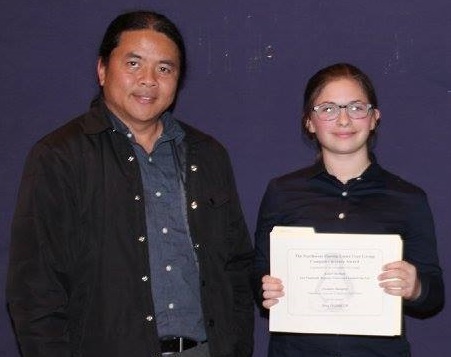 The Northwest Florida Linux User Group (NWFLUG) representative, Mr. Rand Fernandez, presented the group's second annual Computer Science award to Miss Jasmine Sumpter at the Robert Sheffield Science and Engineering Fair awards ceremony held at St. Mary Catholic School, FWB, on February 16th. Miss Sumpter, a sophomore at the Seacoast Collegiate High School in Walton County, won the award for her project "Save Hubble 2.0." The award included a check for $100 and a handsome certificate. Miss Sumpter has been invited to a future meeting of the NWFLUG to discuss her project. See a picture of the award below. Photo 1. Mr. Fernandez and Miss Sumpter. This was the 22nd monthly meeting of the group. The nine members attending were: Dean Covey, Kevin Dennis, John Fay, Frank Mahala, Joe Reyenga, Victor Salvador, Bryon Wagner, Phil West, and Tom Browder. We welcomed new members Dean Covey, Joe Reyenga, Victor Salvador, and Phil West. No formal presentations were made, but Tom reported on the successful Computer Tech 2016 on 31 January which had over 550 registered. The final head count is uncertain as of this report. Note that members John Fay, Rand Fernandez, and Tom Browder each made two or more presentations there, and at least one new member attending today (Victor) heard about us from the event. Tom also reminded our judges of the science fair judging on Wednesday, 3 February. + Frank Mahala: his Raspberry Pi used as an ad-blocking server and problems with the SD card used for writing logs; use minibian or raspian OS. See the resources section for a link to the ad-blocking website Pi-Hole. + Tom Browder: how Github facilitates open source project collaboration. Photo 7. Candidate MACO00MS; Braeden Veale: What household item cleans skateboard bearings best? Photo 8. Candidate ENMS005HS; Daniel Bobbit: Go with the Flow - Manipulating the Components of a Tesla Turbine in Order to Better Apply Them tp Certain Situations Photo 9. Science fair helper, Bohdin Fernandez (elder son of Rand). Photo 10. Judges working in their special work and dining room. Photo 11. Our judge John Fay hard at work on his special awards. Photo 12. The presentation hall. Photo 13. The presentation hall. This was the 21st monthly meeting of the group. The seven members attending were: Kevin Dennis, John Fay, Rand Fernandez, Bruce Gray, Frank Mahala, Bryon Wagner, and Tom Browder. We welcomed new member Bruce Gray. Bruce is a Snow Bird (U.S.) and will be here though March. Tom covered several items including a short presentation on Linux utilities for hardware. The slides can be seen here. Frank Mahala mentioned he was building an ad-blocking server on a Raspberry Pi 2. He used the instructions found at http://pi-hole.net/ with some modifications for his home network. He said his browsing should be a bit faster from most ad-heavy websites. Kevin Dennis showed us a file server he is building using a mini-ATX board in a case with up to four hard drives. He got the board for about $85 from Amazon. John Fay was interested in other folks' opinions of free version control sites such as Sourceforge (SF: http://sourceforge.net/) and Github (https://github.com/). He reminded us that SF had a bit of controversy not long ago when they were found to be adding unwanted software along with desired downloads. The consensus was that SF seems to be a good citizen now, and that both are good choices depending on the desired work flow. We noted that Git was very easy to use for submitting changes by forking a repository and requesting a pull of ones changes. Rand Fernandez told us about a website, https://ninite.com/, where you can build a single Windows installer for multiple popular programs. He said it really saves a lot of time for such as he who is expected to maintain lots of Windows hosts for friends and family. Bryon bemoaned the fact that he had just had to install lots of programs over the holidays annd could have used such an aid. Before the meeting ended, thanks to Rand, we now have the $100 needed for the Computer Science award we will be giving in February. Kevin Dennis will try to take some pictures of his file server project and give a presentation on it at the next meeting. This was the 20th monthly meeting of the group. The five members attending were: Bryan Allen, Rand Fernandez, Frank Mahala, Bryon Wagner, and Tom Browder. We welcomed new members Bryan and Rand. We discussed the upcoming Science Fair and our participation as judges and the presentation of our Computer Science award. So far we have raised $60 toward the $100 needed for our cash award. Those wishing to be a judge need to register here using the "Registration | Judge" link at the upper right of the page. Please let Tom know if you register as a judge (so far, Rand and Tom have done so). We also discussed the upcoming Computer Tech 2016 (to be held 30 January 2016) and Rand volunteered to make two presentations. He has contacted Carl Loftrom and made the required arrangements. Tom is also presenting at the event. We need volunteers to man a table to represent our group. Tom will make some kind of poster for the event. See Computer Tech details at http://www.nwfacug.org and https://computertechnwf.org. Rand Fernandez then gave an interesting presentation on the web-based game Multicraft (and Minecraft), parts of which he will present at Computer Tch 2016. Code he showed for the installation of the Multicraft server panel can be seen at http://pastebin.com/iYaAgR4V. The website where he found the servers he leases is at http://www.webhostingtalk.com. Tom wrapped up the meeting by saying he needs feedback on everything! We can't continue as a viable group unless we get a better fell of how we're doing and where do we want to go. In that light, please send him suggestions for presentations for future meetings (better yet, volunteer!). This was the 19th monthly meeting of the group. The three members attending were: Kevin Dennis, John Fay, and Frank Mahala. I suggested that the group look into getting involved in the FIRST Lego League robotics competition with local schools, either individually or as a group. We spent a good bit of time researching what the FIRST Lego League is all about. It was also suggested that it would be an excellent youth activity at large churches such as at Crosspoint Church. The Okaloosa County School District has a formal robotics competition and the individual local schools may be looking for adults with computer savvy to serve as mentors. Finally, I gave a short presentation on the mathematics of fractal curves. I showed what it means to say that a fractal curve has a non-integer dimension, how to calculate its dimension, and how to express it in terms of matrix algebra. I also showed a couple of short sample "freeglut" programs that generate fractals in two different ways. This was the 18th monthly meeting of the group. The five members attending were: Kevin Dennis, John Fay, Frank Mahala, Chris Roth, and Tom Browder. We welcomed new member Chris Roth, who works with Kevin Dennis. The planned agenda slides are shown here. In addition, Tom reported those wishing to give one or more presentations at the upcoming Computer Tech (see also here) need to give event founder and leader Carl Lofstrom (850-586-0603) a brief description of each by 12 October. Great news! In just four months, on Saturday, January 30, 2016, our 10th Computer Tech will take place at the NWFSC, Student Services Center, Niceville Campus. Can you give us some idea, for planning purposes, what you would like to present on January 30, 2016? The feedback from some of our attendees is they would like to see more subjects for Beginners and a few more subjects for Advanced computer users. This time around can you label your workshop using one of the different categories, Beginner or Beginner to Intermediate or Intermediate or Intermediate to Advanced. This is will not only help make it easier for the presenter to prepare but will also help the attendee decide which class to attend. The key to our success is to keep a balance in our Schedule of Events with enough variety and new subjects to give computer users a reason to attend. Computer technology is changing almost daily. How you decide which subject to choose to attract the most attendees is the same challenge all of us are having to deal with. Some of you had rooms overflowing and had to turn away attendees while others had programs that did not attract more than just a few. No one can tell for certain what subject will be popular come January 2016. My advice is to think carefully before choosing a subject and develop an eye catching description for your Schedule of Events block. With the popularity of Microsoft Windows 10 let’s consider at least two separate workshops, one for the basics and the other one for the more advanced functions. The same could be true for the Apple iPad and iPhone. Remember not everyone attending Computer Tech is a Techie. Some of the most well attended workshops in the past were on subjects semi related to technology. You decide which subject to choose. I will let you know if other presenters are planning to make a similar workshop as yours. Hey this is our 10th anniversary so please come up with a really great subject and leave that old PowerPoint on the shelf this time. We would like to make available a draft copy of our Schedule of Events by October 15, 2015. Please email me your subject with description by Oct 12, 2015. The sooner we get started the more time we will have to fine tune the program. PS: Eddie Branch, eddiebranch@me.com, is working with the Mac and iPad and iPhone presenters. Email Eddie if you were would like to give a presentation to his group. Tom gave a presentation on various means of testing Linux distributions before final installation, with an example of using Virtual Box on Windows to install Ubuntu 15.04. The slides are available here. This was the 17th monthly meeting of the group. The five members attending were: Andrew Merts, John Fay, Mike Kaiser, Frank Mahala, and Tom Browder. John Fay gave a talk on IEEE Standard 754 . The standard specifies how floating point numbers are handled with binary digits on computers. He prefaced the presentation with a review of binary integer arithmetic. He then went on to illustrate the IEEE standards for handling 16-, 32-, 64-, and 128-bit binary floating point numbers. The members enjoyed the talk, and we thanked John for an entertaining and informative session. Tom Browder queried members present about ideas for future meetings. He proposed, and it was agreed upon, to survey all members via e-mail for their top three choices of topics for future presentation. He will consolidate the replies and present them back to the group while seeking volunteers to present the topics at a future meeting. The goal is to get a primary and backup presentation scheduled for several future meetings so that the programs can be advertised several months in advance. Several topics of interest were discussed briefly: (1) Frank Mahala would like to hear more about virtualization on Windows so he can experiment with new Linux distributions before deciding to upgrade his Linux hosts. (2) John Fay would like to hear a presentation on the Linux boot process and what is happening step by step. Andrew Merts expressed interest in presenting one or more of those topics, but he agreed to await the survey process before volunteering to present a topic. Tom and John reminded new members about our annual Computer Science award we will again present to the student presenting suitable projet at the local scince fair to be held early in 2016. We should soon be receiving a form to complete as one of the award contributors. We will again present a check for $100.00 to the winner. Members can contribute toward that amount to John Fay who will handle the finances as he did last year. We will also present a certificate, a draft of which can be seen here. This was the 16th monthly meeting of the group. The six members attending were: Andrew Merts, Louis Carter, Kevin Dennis, John Fay, Frank Mahala, and Tom Browder. We welcomed new member Andrew Merts who found us via the Calendar in the Bay Beacon. Tom Browder started a free webcast, from publisher O'Reilly's web site, on the Git version control system. The link to it is here. Kevin Dennis showed us how he uses his Raspberry Pi to povide a web cache for his home network. Part of the secret is his use of Webadmin to ease administration of his Raspberry Pi server. Tom pointed out that we would have to have the next meeting somewhere else since the church will be locked up tight for the Labor Day holiday. Ideas are solicited and should be forwarded to Tom. This was the 15th monthly meeting of the group. The four members attending were: Kevin Dennis, Mike Kaiser, Frank Mahala, and Tom Browder. Tom Browder gave a presentation on Document Version Control systems (VCSs). The objective was to introduce the audience to the topic. The presentation included a short demonstration of git, but the demo was cut short when Tom's ad hoc key stroking went awry. He will finish the demo at the next meeting. The presentation slides are available on the NWFLUG git site (see the menu item NWFLUG on Github). Kevin Dennis gave an impromptu chalk talk on file system snapshots as an adjunct topic to VCSs. Note that R1Soft is offering a free snapshot tool for Linux servers using nearly any device and file system type. Kevin Dennis said he will give a presentation on creating a web cache using a Raspberry Pi. Tom will finish the VCS demonstration. This was the 14th monthly meeting of the group. The five members attending were: Louis Carter, Kevin Dennis, John Fay, Frank Mahala, and Morris Stevens. We welcomed new member Louis Carter who found us via the Calendar in the Bay Beacon. Morris Stevens demonstrated hi Internet radio working on a Raspberry Pi. Tom will discuss version control systems and his new Perl group he is forming. This was the 13th monthly meeting of the group. The seven members attending were: Kevin Dennis, Mike Kaiser, Matthew Kimm, Frank Mahala, Morris Stevens, Bryon Wagner, and Tom Browder. We welcomed new member Kevin Dennis who found us while browsing the Internet. Tom reported no change in information from the STEMM Academy or Northwest Florida State College. He said he would not be contacting them again for a while. Tom's letter to the "Linux Journal" did not appear in the May issue. Tom passed around a draft copy for an NWFLUG business card. The final is to be printed on card stock with cards already scored for separation. Each page has twenty cards on it. Tom asked all present to consider the draft and make comments via e-mail. He will make a final draft for approval before the next meeting. He will then print cards to be handed out at the next meeting. Tom presented a video presentation (provided by Carl Lofstrom) given during the APCUG Winter Virtual Conference (Feb 21, 2015): Linux Software Superstore given by John Kennedy. Frank Mahala mentioned the video would be good to present at an installation session. Tom said he saw some apps he had forgotten about. He suggested we all compile a list of our favorite programs and compare notes at the next meeting. Tom presented a short talk on Perl 6 (it actually went about 10 minutes). The notes are available on the git site for this meeting date. Tom said he had approval from Crosspoint UMC to set aside the second Monday in each month for installation sessions for interested folks. Details are on the web site, and the sessions will be by appaointment only. Tom will add one new resource to the web site (see top item). Tom handed out posters for the next meeting for all to hang on public bulletin boards. The new posters also mention the new installation sessions. This was the 12th monthly meeting of the group. The six members attending were: Ken Bentley, Antonio Brum, John Fay, Frank Mahala, Morris Stevens, and Tom Browder. Matthew Kimm sent Tom a copy of the flyer modifed to show the next meeting date. Tom handed out several copies and said the master is on the Dropbox site available to all. The intent is to put up current posters on neighborhood community bulletin boards. While discussing the issue, Frank mentioned maybe having NWFLUG member business cards. Tom said he would check on Vistaprint. Tom reported not hearing from Ms. Neely Calhoun about further interest in any NWFLUG participation in the STEMM Friday lunch talks. Tom reported not hearing from NFSC on hosting our group. Tom proposed a permanent future agenda item be a Lightning Talk session where members get up to five minutes maximum to talk about anything they want to. Members are encouraged to e-mail Tom with topics in advance of the upcoming meeting so they can be advertised. Tom plans to always bring a timer to meetings to enforce the five-minute limit (or we can use a timer on someone's smart phone). John Fay presented an interesting session on the freeglut utility library (version 2.800, version 3.0.0 is the latest) for OpenGL. He walked the group through downloading, configuring, and building the libary and demonstration programs. He also stepped us through the code for the Lorenz Attractor program showing the basic window-setup code and then the graphical user interface (GUI) code. During the session John gave us bits of history behind the development of freeglut and some of its developers. Part of the story involved the humourous writings of one of the original developers, Steve Baker, and his Cardboard Cutout Dog. Finally, John mentioned another of Steve Baker's projects, the GUI toolkit named Picoscopic User Inteface (PUI). Resources: freeglut, Steve Baker's web site, Cardboard Cutout Dog, and PUI. Morris Stevens showed off his new wirelss signal amplifier. Its characteristics include a high-gain, very directional antenna coupled to an electronic device that processes detected signals for local use. Morris said the device can be further modified to retransmit the signal, thereby providing a way to use free but very weak wireless signals such as that found in campgrounds. Tom asked for volunteers to provide a presentation for the next meeting. Antonio Brum volunteered to host a video presentation of his choosing. He will e-mail his choice to Tom later. Members are also encouraged to post flyers announcing the next meeting. Finally, please check the updated "Resources" page. This was the 11th monthly meeting of the group. The four members attending were: John Fay, Matthew Kimm, Morris Stevens, and Tom Browder. Results of the Science Fair. On 17 February, Dr. John Fay presented our first annual computer science award to Patrick Womack, a senior at Niceville High School, for his project entitled "The Effect of Heat on Power Consumption by Computers." It was mentioned that it would be nice to get Patrick's contact data to get a picture of him with our judges John Fay, Morris Stevens, and Antonio Brum. It would Also be nice for him to present his project at one of our upcoming meetings. We agreed to participate again next year and hope that more publicity will increase the number of eligible projects. Tom Browder later e-mailed Neely Calhoun requesting copies of publicity materials and agreeing to present the same award next year. He also asked Neely if there were other ways we could help the STEMM Center and she mentioned the possibility of mentoring students in a planned summer science camp, as well as giving 20-min talks to STEMM Academy students during Friday lunches. See the STEMM web sites here and here for more information. Matthew Kimm volunteered to draft a brochure for advertising our existence at local tourist venues as well as a flyer (poster) for publicizing our upcoming meetings on community bulletin boards. His excellent work may be seen in his draft brochure here and his poster here. Tom Browder mentioned he had contacted Laura Schultze, the Manager of Professional and Continuing Education at NW Florida State College, about the possibility of getting the same meeting space benefits as other local coumputer groups. Laura assured him she would research the matter and get back to him. Tom pointed out some of the shortcomings of the current facility including inadequate projector and insufficient 120-volt outlets for laptops. Tom Browder suggested we start soliciting volunteers for the program for future group meetings, and he specifically asked for a volunteer presenter for the April meeting. John Fay volunteered to present his GUI Programming seminar, a series which will probably take up several meetings starting with the first to be presented at the April meeting to occur on the 6th of that month. Tom also mentioned that, as an ACM member, he is allowed to show member-only webinars as long as no fee is charged. A list of available webinars is available on the ACM web site: http://learning.acm.org/webinar/. Contact Tom if you are interested in using one of the ACM webinars as a main program item for a monthly meeting. This was the 10th monthly meeting of the group. The six members (including two new ones) attending were: Antonio Brum, John Fay, Matthew Kimm, Morris Stevens, Bryon Wagner, and Tom Browder. We welcomed new members Antonio Brum and Matthew Kimm. Matthew found out about our group during the preparation for Computer Tech 2015, and Antonio heard about the group from Tom Browder while attending Computer Tech 2015. Three members attended Computer Tech 2015: Antonio Brum, John Fay, and Tom Browder. John Fay enjoyed the experience and mentioned he will consider presenting a topic at Computer Tech 2016 on the Graphical User Interface (GUI). Several members bought laptops, and we watched John Fay as he wiped out Windows 8 and installed Ubuntu 14-04.1 LTS (64-bit) on his new Dell laptop! Take that, MS! Tom finally finished Part 4 of his presentation on a free web server. The detailed procedures, scripts, and files can be obtained from his GitHub repository: nwflug-web-devel. We had to get firm commitments for the Science Rair judging and the four volunteers were: Antonio Brum, John Fay, Mossis Stevens, and Tom Browder. An e-mail was sent to Ms. Neely Calhoun, East Panhandle Science Fair Director, identifying same. A report of the experience will be solicited from the judges at the next meeting. A volunteer was solicited to propose an NWFLUG tri-fold bochure and a flyer for advertising our group. Flyers will be posted on various community and store bulleting boards and brochures will be used as hand-outs at suitable gatherings. Matthew volunteered and John Fay volunteered to help him. Four members volunteered to have their pictures published on this web site, and five members agreed to have their e-mail addresses published. Note two pictures in particular are a bit fuzzy due to the photographer's error--we should take a new one. Tom mentioned he is looking for new facilities and will pursue club status with the Northwest Florida State College. This was the 9th monthly meeting of the group. The two members attending were: Tom Browder and John Fay. The main topic of discussion was the NWFLUG science fair award. Two items were voted on and approved: (1) the information sheet for the Science Fair Director, Ms. Neely Calhoun, and (2) the choice of grayscale for the award certificate. The final information sheet was e-mailed to Ms. Calhoun on 6 January with CC to all current NWFLUG members. The choice of grayscale is the 0.90 one. In addition, members were encouraged to register for free tickets to Computer Tech 2015. Details are on the home page. Members are encouraged to (1) have their picture taken for the roster and (2) give permission to list contact details on the roster. See Tom for any of the above. Note on the home page notice of another edition of the free Introduction to Linux course which opened on 5 January. This was the 8th monthly meeting of the group. The five members attending were: Ken Bentley, Tom Browder, John Fay, Mike Kaiser, and Bryon Wagner. Tom reneged on his fourth installment of "Building and publishing an inexpensive (free) Linux cloud web server" due to technical difficulties and poor time management. He will try again next meeting. Draft certificates were presented by Tom and the group voted on number two. However, all agreed that the gray scale was too dark. See that version here. Tom is to produce several gray scale variants and distribute them to members for another vote or comment [such were e-mailed to all members on 2 December]. John Fay said that he had contacted the person responsible for the science fair schedule and other details and introduced our award and contact information. A copy of the email was provided for all to view. We hope to hear from them soon. Further discussion of the award involved specific judging criteria (not for dissemination to contestants) and general criteria for public dissemination. The consensus is to expand the general criteria John provided in his e-mail and provide the revised general criteria to all members for comment. The discussion included whether or not any award should be presented if no project qualified. John said we should have a relatively low-level of qualification based on his experience. Ken Bentley rightly noted that the purpose of the award included marketing for our group, so we definitely want to find at least one suitable candidate during judging. has the candidate submitted code to a public repository (e.g., Source Forge, Git Hub)? does the candidate use open source tools? does the candidate use open source tools in an innovative manner? Not deemed qualifying would be projects that merely used open source tools in a basic, conventional manner, nor would a "code monkey" qualify. Tom reminded all of the Computer Tech '15 on January 31, 2015, and the free Linux course which ends in December (but an updated version will be started on 5 January). The meeting ended with a suggestion that we arrange for another day in the month to be reserved, as needed, for Linux installation. The plan is to announce a date, probably via the Bay Beacon and this web site, and provide at least one volunteer on the announced day if, and only if, we get one or more interested people. Tom will check on room availability. This was the 7th monthly meeting of the group. The six members attending were: Ken Bentley, Tom Browder, John Fay, Mike Kaiser, Morris Stevens, and Bryon Wagner. Tom presented his third installment of "Building and publishing an inexpensive (free) Linux cloud web server." The series will form the basis of his presentations at the upcoming Computer Tech 2015 to be held on the Niceville campus of the Northwest Florida State College on Saturday, 31 Jan 2015. Remember, the code used in the demonstrations is on the "Dropbox" link on the menu at the left. Members are encouraged to propose a presentation for Computer Tech 2015 (e.g., Morris: Raspberry Pi; Bryon: modern Ham operation). Prospective presenters should call Carl Lofstrom at 850-586-0603. We discussed the proposed prize to be presented by this group to a suitable winner at the annual "Robert Sheffield East Panhandle Regional Science and Engineering Fair" to be held in February 2015. The award will be for the best project using Linux. We threw $100 in the pot for the monetary prize, and a suitable certificate will be circulated among our members for comment and eventual approval. Be thinking about judging criteria for selecting a winner. Note that there does not have to be a winner (in which case we may do like the Lotto does on rollovers and add $100 to sweeten the pot the next time). Judging for the science fair is normally held on the Wednesday evening before the fair which is held on a Thusday late in February. An informal discussion bubbled up about radio hams (Morris Stevens and Bryon Wagner) which could be an interesting topic if one or both volunteered. This was the 6th monthly meeting of the group. Attending were Morris Stevens, John Fay, Gary Dale, and Steve Strait. We welcomed new members Gary Dale and Steve Strait. They learned about the group from reading the "Bay Beacon." Morris led the meeting and showed the introduction to the Raspberry Pi which seemed well received by those present. The presentation can be found at the O'Reilly site here: http://www.oreilly.com/pub/e/2650. Morris' Internet radio was displayed and demonstrated as one of many uses for the Raspberry Pi. John announced that there would be a new release of FreeGlut (Ver. 3.0) in November. John also mentioned that next month would be the deadline for deciding on a science fair award. During the ensuing discussion it was agreed that perhaps $20.00 each would be a fair and adequate donation towards the award. The meeting was cancelled due to the Labor Day holiday. This was the 5th monthly meeting of the group. Attending were Tom Browder, Morris Stevens, Pat Bowyer, Mike Kaiser, John Fay, and Bryon Wagner. We welcomed new member Bryon Wagner, a long-time Linux user. Bryon learned about the group from reading the "Bay Beacon." Tom presented Part 2 of a tutorial on building a simple web site. The project changed to using a free web server from Amazon's Web Service (AWS). The handout and code are available on the "Dropbox" site in the "nwflug-web-devel" directory. A handout describes the steps up to getting the latest Apache software onto the server. Scripts are provided to make it easy for the user to login to the remote server or transfer files and directories from the local host to the remote server. The AWS site for sign-up or login is here. Part 3 will be presented next meeting and will include building the latest Apache web server, configuring the web server, and publishing the new site. John Fay brought in an OLD laptop on which we tried to install the latest Ubuntu distribution, but we couldn't get past a software failure. Morris offered an earlier Ubuntu version live CD but that didn't work either. Bryon suggested John try another distro which used to be called "Puppy Linux" which he has found to work on very old hardware. John will report results later. We discussed the group project to award a prizes at the annual county science fair and a trophy, but John suggested that what the students really like is a certificate (unframed) and money! We could pick a first and second place winner and give something like $100 and $50 each, respectively. John mentioned we need to have a solid plan to float as the schools get interested in early November (three meetings away!). John also mentioned that his mother always said an investment in education was always worthwhile and that he would be glad to support the project. This was the fourth monthly meeting of the group. Attending were Tom Browder, Morris Stevens, David Bentley, and Kevin McGovern. Tom briefly went over notes from the previous meeting and welcomed new attendee Kevin McGovern. Tom handed out a copy of an e-mail showing that the NWFLUG is now an officially-recognized user computer group sponsored by O'Reilly Media, Inc. Collectively, groups like ours are members of the "O'Reilly Communities" and are eligible for discounted books from O'Reilly. We now show the O'Reilly group badge below the menu list on each page of our web site. Group purpose was revisited, andTom reminded attendees that we are committed to help with next February's Computer Tech Expo to be held at the Niceville campus of the Northwest Florida State College. He also mentioned John Fay's idea of sponsoring an award for the local Science Fair (which John is pursuing). A suiable trophy or plaque should be able to be obtained locally for less than $80. A short discussion of Linux distributions was held with Ubuntu (or Ubuntu variant) being the consensus choice for recommending to new Linux users. Other distros may be more suitable for special uses, but Ubuntu gets the most public and company support and therefore has more readily-available help for inexperienced users. David Bentley demonstrated (using Mac OS X) some POSIX command line tools one-liners showing the power of the one-purpose tools and piping that are the hallmark of POSIX systems like Linux (and OS X). With a set of one-thousand small, automatically-generated files, David sliced and diced their data with 'bash', 'sed', 'grep', and 'awk' to the delight of a fascinated audience. Tom presented Part 1 of a tutorial on building a simple web site using a framework he created to easily generate, update, and maintain multiple sites. It is the same system used for this site. Included was a handout with step-by-step instructions for setting up a remote server on a Digital Ocean droplet. The handout and code are available on the "Dropbox" site in the "nwflug-web-devel" directory. Part 2 will be presented next meeting and will include building the latest Apache web server and OpenSSL library, configuring the web server, and publishing the new site. For that session, an instance of an Amazon EC2 microserver will be used. This was the third monthly meeting of the group. Attending were Tom Browder, Morris Stevens, Ken Bentley, Mike Kaiser, and John Fay. Tom briefly went over notes from the previous meeting and welcomed new attendee John Fay (who was promptly handed a survey). Morris Stevens gave an interesting presentation and detailed demonstration of the Raspberry Pi (RP) mini-computer, including hands-on looks at his RP-powered internet radio and his latest RP destined to be his local network file server (running at a cool eight watts, Morris says the device should pay for itself in a year by power savings). Mike Kaiser gave a presentation on using the security tool Security Enhanced Linux (SELinux) on a commercial production network. Mike suggests strongly that multi-user networks be operated with SELinux controls turned on. SELinux is part of the Linux kernel and its capability is available wih most popular Linux distributions including Scientific Linux, Debian, Ubuntu, RedHat, Centos, Fedora, and openSUSE. Public Linux installation parties whereby we would schedule such as we get interest. Morris suggested we select one distribution as group and we will discuss that at the next meeting. John Fay suggested a Linux award for local county Science Fairs from NWFLUG. He will get with his school system contacts to determine their interest. Tom mentioned advertising and encouraging interest people to get actively involved in FOSS projects (such as his favorite: BRL-CAD). John noted that he has been active in several FOSS projects, among which he is an administrator for the FreeGLUT project, a project critical to the complete use of OpenGL for Linux (you can see one of John's contributions mentioned on this page). Tom encouraged all to take a look at the Django and Fosswiki sites (see Resources) to recommend one for this web site. Several interesting resources were mentioned during the meeting, and links to them are available on the "Resources" link at the left. This was the second monthly meeting of the group. Attending were Tom Browder, Morris Stevens, brothers Ken and David Bentley, and Mike Kaiser. Tom briefly went over notes from the previous meeting, restating his ideas about the NWFLUG. He also took the first-meeting survey of the new attendees and then discussed the combined results from the two meetings (see meeting materials). Ken Bentley gave an informative presentation on the 'vi' editor. After the meeting, Mike Kaiser provided a link to a book he highly recommends. See the new "resources" link to the left. Meeting materials are available on the "Dropbox" link at the left. This was the inaugural meeting of the group. Attending were Tom and Missy Browder, Fred Kennedy, Pat Bowyer, Brad Williams, and Morris Stevens. Tom presented his ideas about linux and the NWFLUG. He also took a survey of attendees. Morris showed off his Raspberry Pi radio and demonstrated his ASUS net book with Ubuntu 12 installed. Although the initial attendance was sparse, attendees agreed to meet again. We will tell friends and neighbors about the group and hope to create more interest. Also note four persons who planned to attend couldn't. The new meeting times are expected to better fit normal working schedules and enable more attendees.